Before municipal fire services were introduced, private companies would fight fires only if a building displayed the appropriate fire insurance plaque. This indicated that the owner had paid the insurance firm their dues and was therefore covered from risk. 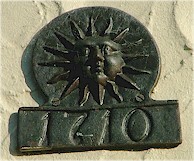 The above wall plaque, on a cottage in Felmersham, is a reproduction of the Sun Insurance sign for 1710.